The answer is simple: push yourself until you can take no more, and then take a step back. There you go - welcome to your sweet spot! This one goes out to all fellow team members: if you haven’t already, you will face an unrealistic deadline at some point in the future. This necessary evil of project management is usually caused by someone’s inability to determine how much time is required for a task to be completed - that someone can either be you or your project manager. In an ideal world, the project manager wouldn’t set any deadlines without first consulting his team. It doesn’t matter who’s the client, or how urgent the project is: the ones doing the work are the ones setting the deadlines. If you manage to avoid disruptions such as scope creep, you can rest assured that all due dates will be met. But, deadlines are bad... Aren’t they? Nothing can be further from the truth. Having a time-bound goal won’t necessarily put pressure on your performance. What’s more, it’ll help you be more productive. If you tend to procrastinate - You may not enjoy the work you have to do at the moment, but due dates will force you to push through. If you need to gain experience quickly - The fastest way to learn is through trial and error. If there is a real danger of scope creeps - Deadlines won’t allow things to get out of hand. It’s that simple. Mind you: if misused, deadlines can bring more harm than good. Deadlines that go on forever - Loose deadline? Be sure that you will end up doing everything in the last few days, as other “more urgent” matters will take up your time and focus. Deadline created without research - Not knowing what the job requires but setting a deadline anyway will buy you a one-way ticket to the blues. Unrealistically short deadlines - We have the rest of the post to cover this issue. Speaking of which, here are some scenarios WHY deadlines may end up being (as we already mentioned) unrealistically short. Your project manager presents you with a project that’s ready to go, with goals, phases, tasks, and the time frame already determined. Quickly, you realize that the deadlines set are unrealistic. However, when you try to communicate your concern, the objection is instantly dismissed with an excuse that the company already made a promise to the client. That leaves you (and your team) in a pickle: the project is destined to fail, you know it, your team knows it - but there’s no one to hear you out. At this moment the “shrug-point” ensues. If you’re a project manager (or work in sales in an outsourcing company), do not set project time-frames without consulting your team. The first thing you need to do is ask them for time and complexity evaluation. Then, encourage them to be honest even when things do not go as planned - usually, resource allocation can get the project back on track. Finally, always provide extra time in case of unforeseen events: Project wise - add 20% to the estimated timeframe. Tasks - add up to 35% if the estimate seems highly unrealistic. Only then should you commit. Disclaimer: as a project manager, you will come across employees who are unable to make correct time estimations, and will usually overpromise. If you are just getting familiar with the team, there is no way to know someone’s habits and tendencies, so you are most likely to feel the consequences. However, handling situations like this is a part of being a good project manager - just be sure that you are the one solving, not creating them. But let’s get back to team members and their issues. You are inexperienced and faced with a project you haven’t been working on before - simply put, you have NO idea how long it will take you to complete ANY of the given tasks. But you make an estimation anyway, and now the entire project is falling behind because you overpromised. 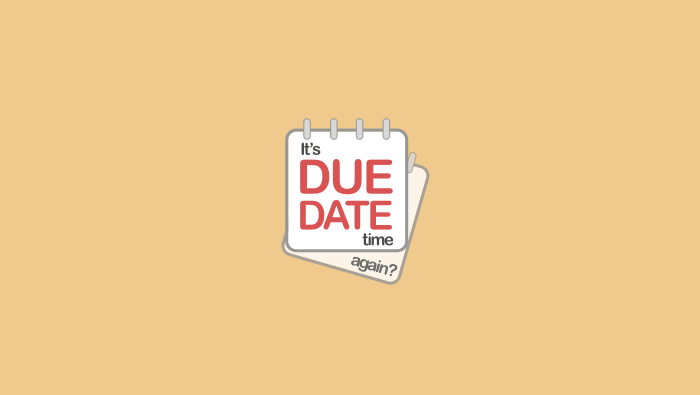 If it makes you feel any better, your project manager is just as “guilty” as you are: it was their responsibility to manage the deadlines and notice if anyone sets an unrealistic due date. They may be just as inexperienced as you, or they do not know the team very well. The bottom line is - the project will be late and bad time estimation is to blame. So, how to stop overpromising, but start setting acceptable deadlines? Well, it’s time to start estimating better (bet you didn’t see that one coming). And while there are several ways to make better time and task estimation, we’ve opted to present you with a somewhat unconventional but effective method. What does that mean? If you take it upon yourself to complete a task that requires eight work hours, and your deadline is in eight hours as well - you will achieve it in eight hours. However, if you get the same task and a three-day deadline, the chance is you will not complete it before the final hour. It isn’t about how much time is required - it’s how much time you got that determines when the task should be completed. Alright, now take the Parkinson’s law - and reverse it. It will take some time, but this technique will not only help you make better estimates, but will also help you increase productivity. Take a type of task you want to create a better estimate of, and start tracking time spent doing it. Daily, weekly, monthly, it doesn’t matter - just make sure you track time you’ve spent effectively on the task (bathroom brakes not included). Be honest with yourself, as that is the only way you'll improve. Repeat the process several times (five, at least), and then average the data. The number you get will be your starting point. Now the real challenge begins. 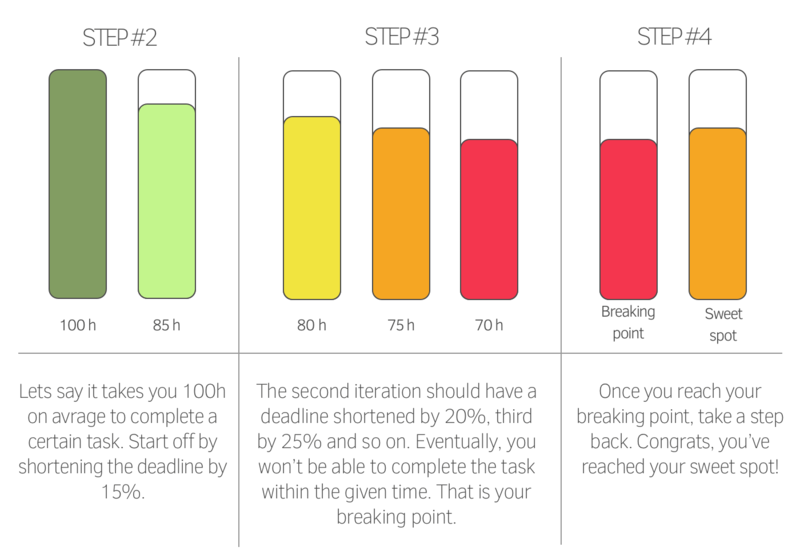 Take your starting point time and reduce it by 15% - that is your new deadline. Act like failure is not an option and do your best to try to beat the deadline. Once the job is done, you will realize that it was no big deal at all. Apparently, people subconsciously extend their deadlines by 20% on average when determining the complexity of the task - a safety net is a good thing to have. It’s all about finding the time frame in which you will be able to complete your tasks without pressure and stress - but also without wasting time. So, during the third step, you should knock off another 5% of an already shortened deadline, and keep doing so until you feel overwhelmed. The essence of “reverse Parkinson’s law” is reducing the deadline bit by bit. If you bite more than you can chew (shortening the time frame by a whopping 75% right off the bat), you are sure to fail. Also, it’s very counterproductive if you are being dishonest about the work you do, and claim that the loose deadline you are comfortable with is the only deadline you can handle. No one said that this was going to be easy. It’s a slow and tedious process, but very beneficial in the long term. It demands devotion, as quitting will cross your mind more than once. It’s done individually, so no one ever has to know how much time you need to complete a specific task. If you work with a project manager who tends to leave some extra time for each task, estimate the actual time. Otherwise, make some breathing room for yourself - just in case scope creep starts ganging up on you and your team.